EU VAT laws for digital goods changed on 1 January 2015, affecting B2C transactions only. VAT on digital goods must be calculated based on customer location, and you’re required to collect evidence of this via an IP address and/or Billing Address. In addition, you need to set up VAT rates in your WooCommerce store to charge the correct amount. This guide shows you how to set up rates specific to Digital Goods. If you’re only selling digital goods, VAT rates can be added under Standard Rates in WooCommerce. If you’re selling/distributing both digital and regular products, you can create and use a new tax class, for example Digital Goods, and update them. Select the Additional Tax Classes setting. Add a new tax class to the list, for example, Digital Goods. Once saved, you can begin assigning this tax class to Digital Goods, but first input the rates. The next step is to input the EU VAT Rates into WooCommerce. The latest VAT rates can be found at the Europa website: http://ec.europa.eu/taxation_customs/resources/documents/taxation/vat/how_vat_works/rates/vat_rates_en.pdf If these rates change, you need to update the VAT rates for your store. Go to: WooCommerce > Settings > Tax > Digital Goods (now a new tab after you created a new tax class). Enter rates for all EU member states. See our guide on Setting Up Tax Rates in WooCommerce. To import this file, click the ‘Import Rates’ button on the tax input page, and an importer will appear. With EU VAT rates set up, users buying a product with the Digital Goods tax class are charged tax based on their location, not the store location. Go to: Products > Products. Select Digital Goods from the Tax Class dropdown. 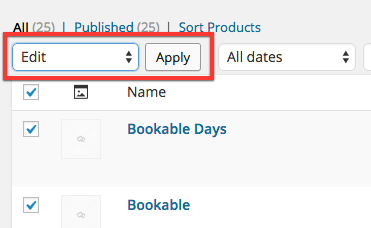 Tick the box to the left of each of the products you want to bulk-edit. Select Edit from the bulk actions dropdown. Set the Tax Class in the dropdown box.